Arabic Lesson consisted of two Arabic language-courses, free of charge and open for the public to follow. During ten days, 40 signed up participants followed the courses, every day from 2 - 4 pm. The participants got the possibility to learn the Arabic alphabet, and common words and expressions were introduced. A workbook, with a specially made dictionary, was offered. Homework was collected daily and displayed on the wall. The Arabic language teacher was Hanada Kharma. She is a Palestinian, educated at Birzeit University in Ramallah and at the University of Oslo. Outside the course hours, an empty class room, with a video showing Kharma, pronouncing the Arabic alphabet, along with an visual illustration of the Arabic letters, would meet the museum's public. The exhibition was curated by Caroline Ugelstad and Inger M. Renberg for the art festival Oslo Open. 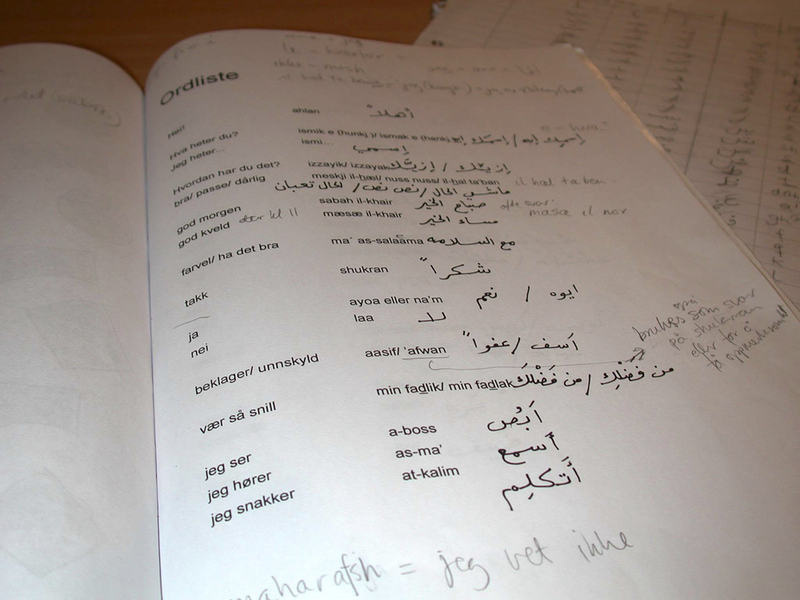 Catalogue text by Caroline Ugelstad: "Arabic Lesson: mot en politisk generøsitet" (in Norwegian).